On this page you'll find more pictures of Neptune, the god of the sea for the Romans (that's how the Greek god Poseidon is called in art). As you know, king Neptune was ruling over the kingdom of the sea. He is often represented as carrying a trident or riding a chariot, where the horses are the seawaves or fantastic marine creatures. 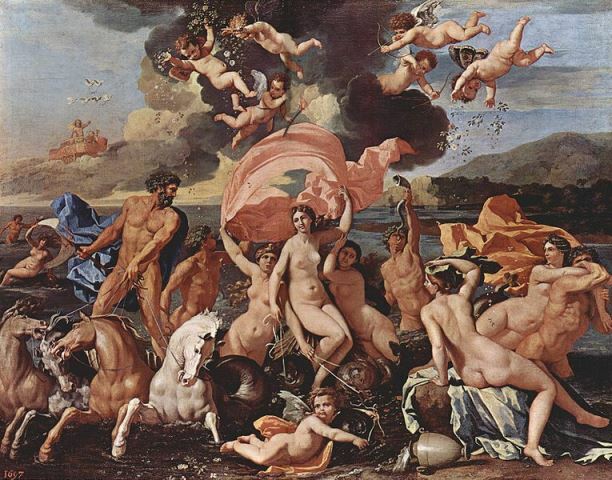 Very often, in the pictures of Neptune, god of the sea, his beautiful wife, Amphitrite, was represented, too (he loved her a lot... but he also cheated on her a lot). And, last but not least, here are some pictures of Neptune as a statue for fountains. After all, who better than him is the right statue for that? The most famous of all is Fontana di Trevi, in Rome, where the central figure is king Neptune riding a chariot.